Page 15: A beautiful Welsh language sampler worked in 1866 by Margaret Griffiths(born c1857 at Llandeilo’r Fan, Breconshire) it has an extensive text from Ecclesiastes Ch12 and 13/14, and unusually the name of the girls parents. From these details we can pinpoint its place of creation with accuracy, since John and Catherine Griffiths are recorded on the 1871 census as farmers of 200 acres, residing in Rhian, in the hamlet of Sclydach, in the parish of Llywelyn, 9 miles west of Brecon. 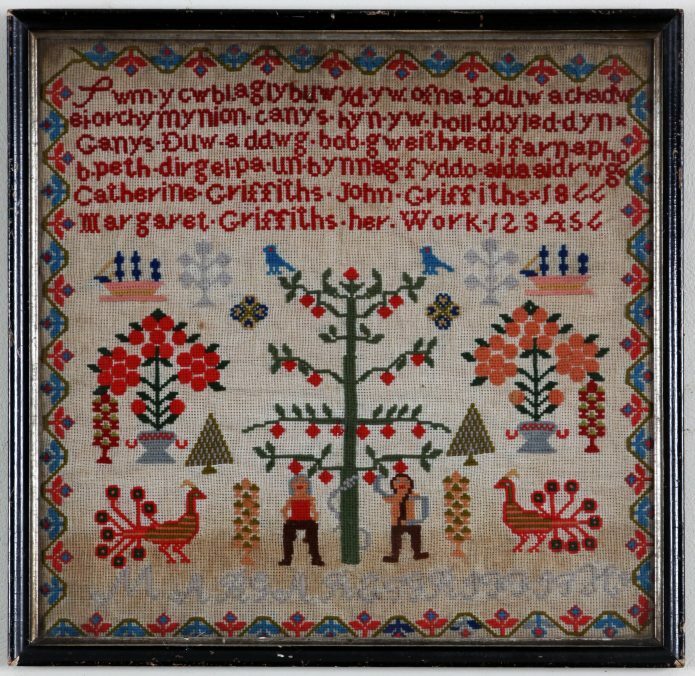 The sampler is vividly coloured, with a range of typical motifs, including Adam & Eve and the Tree of Life, boats and peacocks. Notice the two English words “her work” and the second signature, worked much more crudely along the base of the embroidery.